Raydar Safety Ltd understand the importance when dealing with hazardous materials. Asbestos when left alone isn’t dangerous. However, once disturbed, tiny asbestos fibres are released which can prove lethal if breathed in, causing lung disease and cancer. If you don’t take the right precautions to protect yourself you’re risking your life and your livelihood. 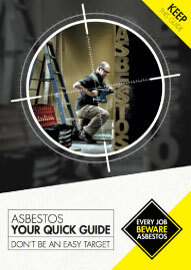 Please download the HSE Asbestos awareness information pack and learn to stay safe when dealing with this material.